Having already reviewed this on YouTube, I realised pretty quickly that I wanted to continue my thoughts and feelings towards Keyakizaka46's Glass wo Ware! in words. This is to not only further my understanding of the music video and its lyrics, but to also touch upon a few scenes and ideas that I may have neglected to include or even see in my initial review. It's also a great reason to return to a more serious tone in PV Reviews. You know, the ones I rarely do these days. In line with things that are rarely done, throughout this review I will include snippets of the lyrics. Because the theme intrigues me, I thought it would be fitting, but for the full effect of what this song about, please look towards Sakamichi Dreams' translation of the song. As to why I chose Garasu wo Ware! for a review, it has to be because it's my favourite of the songs and videos I have watched by the group. It's also the video that left the strongest impression on me, not only because of its visuals, but because the lyrics are powerful yet degrading. It is an impressive track with an equally expressive music video, one that is worth any persons time. From the second the music video begins, Garasu wo Ware! introduces its viewers to scenes of exhaustion and distress - courtesy of Hirate Yurina, who opens the video leaned against the grill of a car - before launching into a powerful and energetic chant. Already, we have been given a dose of what the video promises - a tiring yet powerful portrayal of this songs lyrics, with Hirate at the helm to entertain us all. It's a strong introduction, one that you begin to understand the more you watch, and the further you connect the dots. Hirate herself is a force to be reckoned with here, delivering yet another standout performance that is not only captivating, but memorable. With a perfect portrayal of the frustration these lyrics create, Hirate brings out the true emotions of the song and fight she struggles against in order to have freedom over her own mind in a society that is controlled mentally. From the onset, we see Hirate's break for freedom in her lashing out against a video of herself - her own image reflected in a glass surface - kicking away the domesticated version of herself that has been conditioned to a point where she is too scared to cry out. This is where 'break the glass' begins, and this is where the lyrics begin to synchronise with the imagery. Hirate and Keyakizaka46 are all 'dogs' that won't bark, domesticated by society to be silent and obedient. Hirate actually takes her freedom into her own hands long before the lyrics kick in, but it's interesting to see how perfectly the dialogue fits against the image. It's a striking scene to see Hirate's burst of anger as she lunges towards the television set, kicking it down and appropriately breaking the glass as she shatters her 'ideal' side that society craves. Not long after, we're given another dose of Hirate's break from the standards of the hive mind as she rips away the sling that restrains her arm, before burning it ceremoniously in an act of rebellion. It's a scene I hadn't noticed before now, but it's a powerful one that truly depicts Hirate's resistance to obedience whilst also securing her individuality for future scenes within the video. She's the voice of the song - a person who has broken away, decidedly taking their happiness for themselves instead of clinging to it, waiting for someone to tell her how to be happy. Why do you still cling to happiness? Now that the lyrics have kicked in, it's appropriate to say that the video is finally set in motion. The opening portrays all we need to understand the theme, but the lyrics themselves bring the story to life. With an aggressive, intense choreography, we're given a dose of the power and the struggle that these girls are going through as they fight for freedom. Paired with this distressed and derelict setting, as well as the way Hirate moves during her fight with her own mind, we are given a gritty, almost realistic look into the chaotic mind of an individual. This is a power struggle, and amidst the imagery of a run-down building filled with broken, smokey vehicles and furniture, we catch a glimpse of the anarchy that being yourself can bring when born into a society that stifles who you really are. Yet it's Hirate's struggle that doesn't allow her to back down, and frequently we see her win the fight. The way she commands the other members to fall feels like Hirate telling society she won't listen to their commands any more. The way she dances amongst the others with fierce determination is proof that she is ready to walk the road alone and find her own path. The red coat that she wears amongst a sea of black trench coats is the contrast between her freedom and their obedience. Within the crowd of a hive minded society, Hirate Yurina in her dark red coat is the visual representation of freedom, and how much it can stand out in a society lead by conformity. The choice in costume and its use of colour is one of my favourite things about this music video - it's a subtle reminder of how someone can simply stand out in a crowd because of what they wear. Throughout, we see Hirate clearly against everyone else, because she is the one in the red coat who has claimed her freedom. Everyone else wears black, but their freedom is there, it's just hidden in the lining of their own coats. Where Hirate's coat is red on the outside, but black on the inside, we see how Yurina represents someone who has banished her conformity and truly found freedom, but still fights against it as the others try to bring her down. To contrast this, the other members who have not found their individuality hide the people they want to be, all for the sake of society. Their identities are hidden beneath the black overcoat, but not completely - it's visible when the coat flaps, and we see they are aware of it - but it is never as prominent as the independence that Hirate wears with pride. This is a truly interesting use of colour psychology throughout the music video, and a theme that greatly intrigues me. I may be wrong, but this is my own interpretation, and I only find the idea grows the more I watch this video. Once again, it's one of my favourite aspects of the music video, and I feel strongly about how Hirate stands out because she is the only one who has truly captured her freedom amongst these obedient members of society. Break the glass that’s in front of you! With a firmly closed fist OH OH! Do the things you want to do! I feel like this idea of Hirate obtaining her freedom is only furthered by the music video and the scenes it delivers. Throughout, the only member we see alone is Hirate, save for any given solo shot. Any other scene will include various other members together, singing and dancing or even falling in the presence of Hirate herself. The image is consistent, never allowing the other members to break away because they are the 'hound dogs' of society, trained by people to be obedient and do the bidding of those who say what goes. It could be argued that these sequences of shots are typical in most - if not all - Keyakizaka46 promotional videos, and I agree. A lonely Hirate and a group of various other members is common in the groups library of videos, yet here, it conveys a more powerful message, and I think it fits perfectly with the tone and story that has been created for our viewing pleasure. Hirate Yurina is the individual, the member who will stand alone, whilst the others are the crowd that want to shut her down, the very people that she is trying to defy. Personally, I enjoy these scenes just as much as the ones that show Hirate alone or in complete control of the situation. These group segments are a nice representation of the lyrics, allowing us to look into those who want to break away, but can't find the strength or desire to do so. This is the majority who have an idea of what change they could create, but can't bring up the courage to make it happen, and Hirate, in all her red leather clad glory, is the dream they hold and the goal they run towards. She's their inspiration, and despite how much they want to bring her down you know that deep inside, they're also the ones who long to be just like her. It is incredible how much this video speaks out about the topic of conformity and how much it makes you think. It is a truly inspiring, fitting video that not only delights me, but gives me chills as well. Having focused on the theme of the video, I want to direct my attention to the look and the choreography. There is a lot in this video that you can take a look at and immediately feel captivated by, but at first, my sole interest was in the camera work - it was the start of a love that would blossom into something more. With its use of the bolt camera and interesting angles, the way everything moved and how the choreography created such friction, I was immediately taken by the magnificence of this video. It's such an exhilarating, majestic piece, and it is the use of its camera and the pace that really brings the lyrics alive. Glass wo Ware! is a flurry of movement, matching the aggressive pace of the song perfectly. The choreography - freestyle or uniform - is electrifying in every scene, and the camera work matches up to both the beat of the song and the movement of the dance in the most satisfactory way. It is undeniable how frantic the video feels in its final form, but it is this hurried, dramatic style of choreography and camera work that creates such an emotional piece. With each swing of the camera and every hair that falls in a members face, you realise the situation they are in and understand the earnest they have in breaking away, one step closer to the freedom they are so desperate to obtain. Camera angles and choreography paired together can create something powerful, and here we see the product of power that these two things have created. It may seem like the technical side of a music videos creation is insignificant, but to really bring the choreography and the story of the lyrics to life, the camera work has to fit with all that is played out. If the angles and shots were stationary, the excitement we feel upon first watching Glass wo Ware! would not be there, and the determination we feel as Hirate grasps freedoms invisible thread would be void. Without those spinning shots or falling angles, feelings of despair, tiredness and frenzy would be lost, and we'd have a pretty standard music video that may barely match the tone to the music as perfectly as this video does. In regards to the choreography itself, it is truly magnificent. Though it seems to have less of a uniformed look than the groups previous PV's, this one still showcases an idea of unity, more-so with the members that wear black coats. We see these scenes play out when Hirate is breaking away from society, with everyone else fighting back so that they can make the girl in the red coat obedient again. Thankfully, Hirate thwarts their attempts time and time again, often leaving everyone kneeling to the ground, but it's this idea of fighting with society that leaves a strong impression. It's a rather frightening thought to have, this idea that society can have such a big impact on how individuals act, think, feel and even look, but it's represented really well here. The members fight for conformity, and they do it well, showcasing the dominance of the hive mind that Hirate Yurina refuses to come back to. This is all played out in a way that feels reminiscent of classic musical montages or dance battles. The dance battle sequences depicted against Hirate and her fellow members feels similar to the power play you would see in a musical like West Side Story (1961), but for Hirate Yurina herself, I view her frustration and struggle to find herself similar to that one memorable scene from Footloose (1984), where Ren loses himself completely in dance in order to let out his frustrations and aggression over the towns people and their misinformed idea of him. I never said it would be an exact similarity, but the feelings and tone of Garasu wo Ware! is comparable to that of Footloose's warehouse scene, and I feel the point is important enough to warrant video evidence. For both Hirate and her comrades, though, I can see the struggle that they have not only in themselves, but against each other. Hirate has broken away from the crowd and she's against everything they know, whilst the crowd wishes to bring her back into the fold because it's all they know. She is one of them in their mind, therefore, she should act like one of them. Yet Hirate has tasted freedom, but the crowd don't understand this, and through the choreography we see one of the most pivotal scenes where everyone starts to throw their hands towards Hirate, 'barking' to make her conform. It is then that Hirate finally screams, louder than those around her, causing all to fall down in silence from the power she holds now that she has grasped her freedom. Hirate has become the dog in the lyrics that barked the loudest, and with that, she came to understand that her own voice could shape her own future. Break the glass of restraint! With an anger-infused fist OH OH! Glass wo Ware! is a truly powerful PV, one that is mesmirising in every sense of the word. It captures the lyrics perfectly, but also shows us so much visually that creates an even bigger image than the lyrics have already created. The idea of society and conformity, individuality and freedom is a strong message that is only enhanced by the visuals, colour palette and tone of the video. With a stifling, frantic scene that is played out perfectly, we can see how dark but real Glass wo Ware! is. Society is something we are all a part of, and a place we are all stuck in, so the story and messages conveyed throughout this song and PV are relevant to us all, no matter what state or country we reside. Understanding that this is not only about Japan, but the world as a whole, is actually a scary thing, but the concept of both the song and video are inspiring too, and it will allow us to think more about the world we live in and places we visit or dream of. There is so much energy and thought put into this video, from the costume design to the camera angles. 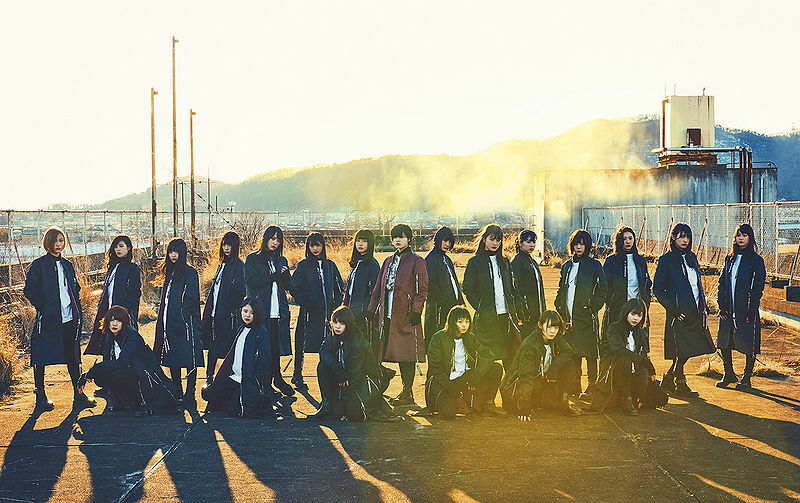 No matter where we look, we are always in motion with Glass wo Ware!, and wee the frenzied, electrifying world of Keyakizaka46. There is never a dull moment, nor is there a point where it feels static or drained. There is a constant supply of energy and movement, keeping us intrigued and wanting more. By the end of it, you only feel energised - maybe a little tired from all that dancing - and you feel content. It's oddly satisfying to watch Hirate Yurina take control of the situation, but it's even better to watch her take everyone down in order to keep herself in check. It's an incredible music video, and it really struck a chord with me. The message, the look and the feel have stayed in my mind for weeks, and I doubt they'll leave any time soon, because that is how powerful Glass wo Ware! is. Smash the things that get in the way! Dark, a little gritty, powerful and memorable. Glass wo Ware! stirs my love for videos, and has allowed me to appreciate the true art of direction and cinematography. It is a beautiful, maybe even a little scary, portrayal of society and the power it has, and the true power of an individual within a crowd of uniform minds. In an abundance of aggression, emotion and a play for power, we are given a deeply thought provoking piece that goes beyond the surface of what we see and here. The outline is there for us to grasp an idea of what the song is about, but once we dig a little, Glass wo Ware! becomes more than we ever expected. Obedience is taught, but obeying the rules set out is optional. This message that Keyakizaka46 is impressive, but it's also true. In order to break away and be free, you need to find your voice and shout as loud as you can, because it's the only way you will be heard in a society filled with obedience and delusion. You’ve only been convinced that it’s there OH OH! Finally, thank you for reading. I hope you enjoyed the post as much as I enjoyed writing it. Until the next post everyone, please take care, and love your idols. Honestly, at first I was fine with Keyaki, then I was a little meh and didn't follow them as much. I just liked what I liked and Keyaki wasn't on my list of idols to follow up until commenters on youtube suggested I react to their videos, and now I'm just hooked. As you said, my love for them actually began with Garasu wo Ware, but I get why Fukyouwaon would be the song that steered you in their direction. The music video is beautiful in so many ways. And yes, isn't Hirate a gem? I am actually planning on it in the long-run! H!P's PV's are still fun, but some are getting so incredible I need to focus more on their themes, ideas and use of shots. I may start with Juice=Juice, who knows?